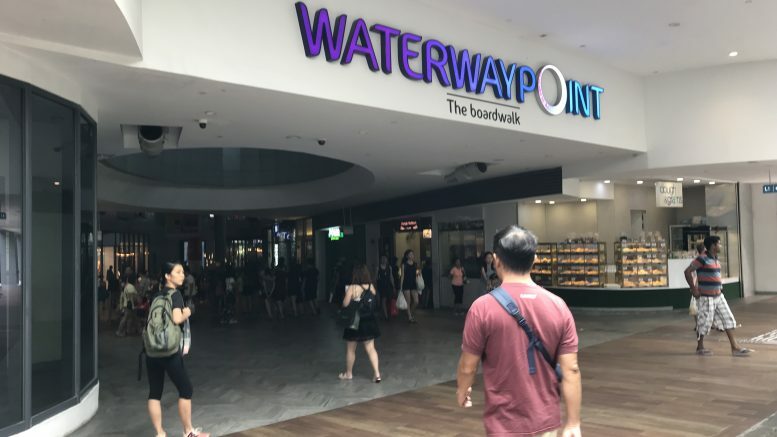 Frasers Property‘s Waterway Point mall at Punggol New Town in Singapore. Frasers Property reported on Tuesday its fiscal first quarter net profit jumped 76.1 percent on-year to S$145.59 million, boosted by a larger recurring income base and sales of residential projects. Revenue for the quarter ended 31 December rose 44.7 percent on-year to S$1.08 billion, it said in a filing to SGX after the market close on Tuesday. “We continued to reap the benefits of having a balanced portfolio of development projects and investment properties this quarter,” Panote Sirivadhanabhakdi, group CEO, said in the statement. “Earnings were boosted by sales and settlements of our residential development projects in Australia and China, as well as an enlarged base of recurring income assets following our acquisition of six business parks in the United Kingdom last year. In addition, maiden contributions from our Frasers Tower office building and the south wing of our Northpoint City shopping mall in Singapore gave our results a lift,” he said. He added that the company would be working on new residential property launches in Singapore and Australia this year and working to improve the performance of its investment properties. The company will launch the 455-unit private residential project along the Singapore River in the first half of the year, the filing said. The results were broadly in line with expectations for full-year forecasts. For the fiscal year, DBS had forecast net profit of S$526 million on revenue of S$3.41 billion. “We believe FPL is a good defensive play within the sector as it has low exposure to Singapore’s residential property market,” DBS had said in a January note. But it added that the company was dependent on the Australian real estate market and currency, with around 30 percent of its profit before interest and tax from Australia, with returns potentially impacted by the weaker Australian dollar against the Singapore dollar. The company reported a foreign exchange loss of S$17.72 million for the quarter, nearly tripling from S$6.47 million in the year-ago period. For the fiscal year, JPMorgan forecast net profit of S$589 million on revenue of S$4.18 billion. JPMorgan said it had expected “healthy” recurring income growth for the full-year on strong growth in Singapore office rents and increasing occupancy at Frasers Tower, a resilient Australian office market, annual rental escalations on its industrial portfolio and outperformance by its suburban malls. But it pointed to concerns over high gearing leaving it exposed to higher interest costs and falling Australian housing prices.